Melanne Verveer’s career has long been intertwined with that of Hillary Clinton. She served as chief of staff to Clinton while first lady, they founded the global women’s organization Vital Voices together. 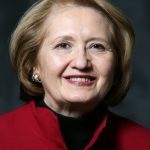 Verveer is known as the force behind many of Clinton’s gender and human rights initiatives, and now serves as the executive director of Georgetown University’s Institute for Women, Peace and Security. In this interview, Verveer talks about the experiences that shaped her work and her leadership perspective.